BOSTON - A man was ordered held on $100,000 bail Wednesday on several charges connected to a bomb scare at the finish line of the Boston Marathon Tuesday, hours after memorial tributes there. Kevin Edson, 25, who also goes by the name Kayvon Edson, is charged with possession or use of a hoax device and making a false bomb threat, reports CBS Boston. Those charges carry sentences of up to five and 20 years in state prison, respectively, according to Jake Wark, the spokesman for Suffolk County District Attorney Dan Conley. Edson, who has addresses in both Wakefield and Boston, is also charged with disturbing the peace, disorderly conduct, and disturbing a public assembly, all misdemeanors carrying minimal jail time or a fine. 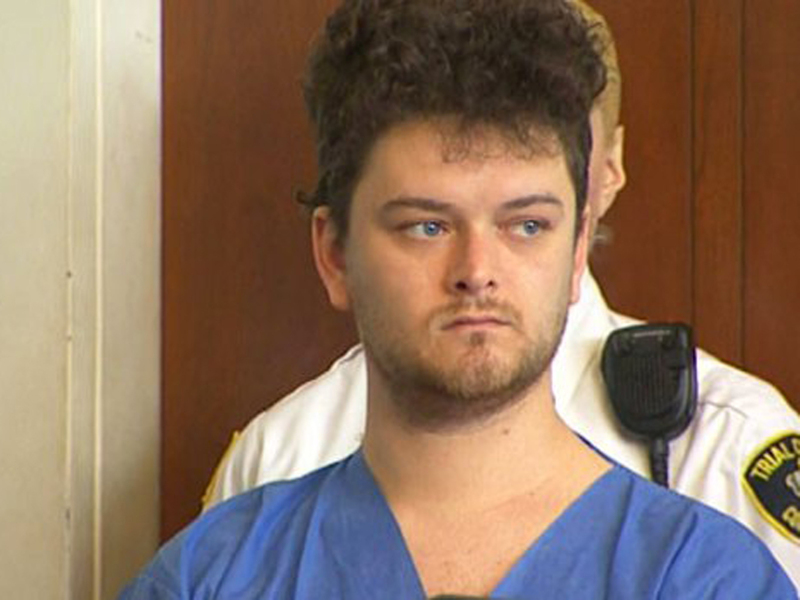 He pleaded not guilty at his arraignment in Boston Municipal Court. Edson, according to police and witnesses, was barefoot, wearing blue and yellow face paint and a long black veil while screaming "Boston Strong" in the middle of Boylston Street at 6:50 p.m. Tuesday. It was a short time after the city marked the first anniversary of the Boston Marathon bombings. At the time, the area was open to the public, but the street was still closed to traffic. This year's marathon will take place Monday. When Edson was stopped by officers, police say he told them he had a rice cooker in his backpack. That's when the area was evacuated, the bomb squad was called in and Edson was arrested. The bag was detonated as a precaution. A source told CBS News that the rice cooker in the bag was full of confetti. A psychologist told the court Wednesday Edson has history of psychiatric problems, but he has been off his medication for months. Prosecutor Susan Terrey said Edson told police he knew what he was doing, calling the incident "performance art." Edson is a student at Massachusetts College of Art and Design in Boston. He was sent to Bridgewater State Hospital for a psychiatric evaluation and is due back in court May 7. Edson's brother TJ posted this message on Facebook after the incident: "What he did at the finish line earlier today is absurd and shameful. It should not be considered art or condoned in any way. Do not play into that. He is a sick person with multiple diagnoses. Unfortunately, no consequences of his abnormal behavior were dire enough for him to shape up before he thought something like this could get him that fame he always chased. Ultimately, he is a disillusioned and very sick individual. I apologize to anyone that takes offense to his actions as his brother. My family has done all we can to foster Kevin's mental health. He is an artist. I am an artist. I understand that much. Thank you God that he did not hurt anybody." Boston Police Commissioner Bill Evans said Wednesday that there will be more security and bike patrols on Boylston Street the next few days due to the bomb hoax.